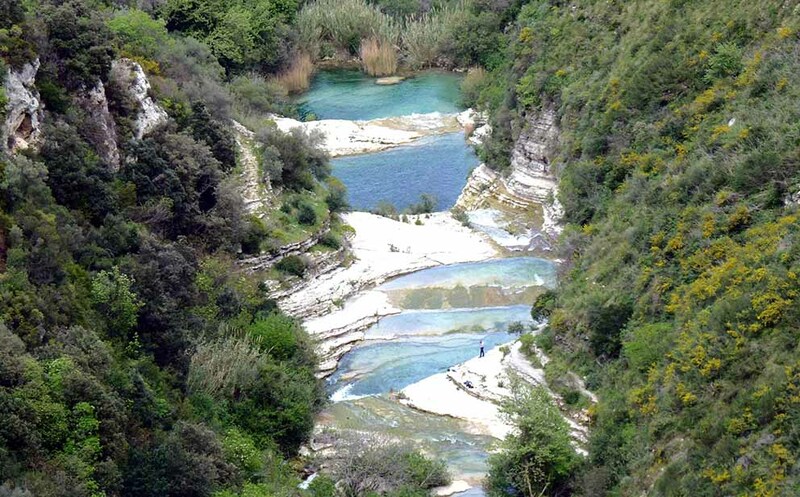 It's not necessary to do a tiring excursion to enjoy beautiful panoramic views over the province of Syracuse till the sea or look down in the canyon to admire the little lakes and the curves of the little Cassibile river. Spring is a great season to visit the nature reserve because the temperatures are mild and the landscape is fullfilled with flowers. During the summer months it's also possible to have a bath in the fresh little lakes which are located at the base of the canyon. There are also archeological remains like the impressive "Grotta dei Briganti", or the prehistoric Cassibile necropolis, at the end of the canyon. There are a lot of pathways with different difficulty grades which permit the visit to Cavagrande. If you are visiting Cava Grande the first time, we suggest the "Scala cruci" pathway which starts at the Belvedere and arrives at the little lakes. The most impressive part of the canyon is the belvedere of Avola antica, from where the "Scala cruci" pathway starts to arrive at the lakes of Avola and at the little waterfalls at the base of the canyon.